Three Faces of the Wendigo—although you would not know that this was the title because it does not appear on the cover of the book, front or back—is an anthology of scenarios for use with The Cthulhu Hack, the light ruleset with player facing mechanics based on The Black Hack for handling quick and easy games of Lovecraftian investigative horror. Putting this oddity aside, the anthology presents three standalone encounters in the snowy, icebound climes of North America with the fearsome spirit of Algonquin legend—the Wendigo and the desperate anthropophagical cravings they engender. Each of the trilogy is a stark white, wilderness bound confrontation with the ultimate in cultural taboos. Long pig anyone? Published by Just Crunch Games, the trilogy opens in media res with ‘Wolves in the Mountain’ by Richard August. The player characters—trappers, hunters, merchants, and residents of the town of Newcome, long left behind by the frontier—are heading into the mountains. Only a day before, a ragged, desperate stranger staggered into town, recounting a tale of treasure, an expedition into the mountains, and betrayal and bloody murder by the expedition leader, Marlowe. Now, the posse of player characters is heading back up the stranger’s path in order to bring Marlowe to justice (and if they find the treasure in the meantime, that is a bonus, right?). Having ascended up the side of the range, the player characters come upon a cave mouth, beyond which lies a set of charnel caverns, full of blood, decay, madness, and something else… Set some time in the nineteenth century—the exact period is never made clear—‘Wolves in the Mountain’ nicely builds a sense of raw horror, almost brazen in its sinewy muscularity. There is a sense also of something ‘Old School’ here in the vaguely dungeon-like caves which echos back to the very earliest of days of Call of Cthulhu when scenario writers had nothing but Dungeons & Dragons upon which to model their adventures. The cloying sanguine atmosphere of the first half is nicely contrasted by the scenario’s second half, a desperate pelt down the down the cold, white mountain, back to Newcombe. Only something has beaten them to it and this where the pacing of ‘Wolves in the Mountain’ becomes flaccid… There is no set ending to the scenario, the Game Master being provided with five potential endings, all of them suitably bleak. It also means that there are five unsupported endings, one of which the Game Master will need to choose and then develop himself if he is to keep up the energy and pacing of the scenario’s first half. He will also need to really provide the players and their characters with some kind of motivation at that point too, because the likelihood is that in comparison to the first half, they are likely to be left floundering, wondering what they should be doing. The middle scenario switches to the Jazz Age of the 1920s and somewhere along the Saskatchewan River. In ‘Lonely, Dark, and Deep’ by John Almack, the Houghton party of Americans, is on a hunting trip. The scenario includes the members of the party as pre-generated characters—Judge Houghton, his wife, Ida, their friend, Doctor Sawyer, a dentist, Ian Corey, a cook, and Motega, a local guide. Echoing Alone Against the Wendigo—the solo scenario for Call of Cthulhu published in 1985—the party finds that at first, nature seems to be striking back at them, but then it does does seem so natural anymore, but rather more unnatural until… This is the simplest of the three scenarios in Three Faces of the Wendigo, being a wilderness set adventure of survival horror consisting of little more than a few scripted scenes. It is short, sharp, and easy to prepare for a one-shot or demonstration game. 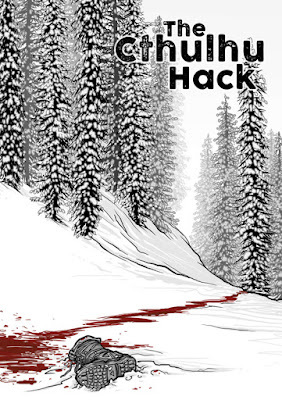 The end scenario is ‘Tainted Meat’, written by the designer of The Cthulhu Hack, Paul Baldowski. It moves the trilogy into the modern day and back to Newcome—or at least a Newcome—where time and life seems to have passed the tiny town by. The player characters are travelling nearby when an accident renders their car in need of repair and in the coldness of midwinter, the nearest town is Newcome. The inhabitants seem odd, ill prepared for visitors, but seem to want to help even if their behaviour is a bit remote. The title of the scenario might suggest what is going on in Newcome, but the player characters will need to put no little effort into finding out what is really going on. This is because in the main, the scenario is set up to be reactive in its response to the actions of the player characters. They will be primarily exploring the town in an effort to discover what is going on in Newcome, essentially rendering the town as a ‘mini-sandbox’. In comparison to the first two scenarios, Tainted Meat’ is very different. Mechanically, it involves a lot more NPCs for the Game Master to keep track of and roleplay, but in terms of atmosphere, its horror is primarily creepy and odd, though there are plenty of scares too. Its pace is much slower, which lends itself to being played over more than the single session. Overall, this scenario is the most sophisticated in the book and brings it to a solid conclusion. Physically, Three Faces of the Wendigo is a neat little book. The front cover is very nice and the internal illustrations are decent enough. The writing needs another editing here and there, and perhaps a little more development in terms of the endings. What the book could have done with, is maps. Now both the cave of ‘Wolves in the Mountain’ and the Newcombe of ‘Tainted Meat’ are described in some detail, but really a map of each should have been included for easy reference by the Game Master. None of the ideas at the heart of the scenarios in Three Faces of the Wendigo are original, but they do not have to be in well designed and well executed scenarios. Which is, for the most part, what the scenarios are in this trilogy for The Cthulhu Hack. That other part—the not the ‘most part’—really comes down to the undeveloped ending(s) of ‘Wolves in the Mountain’, which otherwise starts strong. Of its companions, ‘Lonely, Dark, and Deep’ is a solid, straightforward piece of survival horror, whilst ‘Tainted Meat’ is as creepy and as dark as you would want a taboo busting scenario to be. Overall, Three Faces of the Wendigo is a decent trilogy of one-shot or demonstration scenarios.